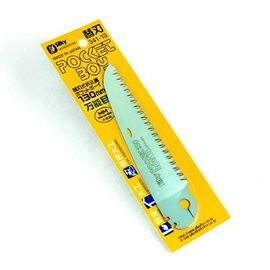 The Silky Fox Pocketboy Saw - 130-10 is an extremely handy tool for any Bushcraft enthusiast. It is super-lightweight and compact design makes it ideal for attaching to your belt. 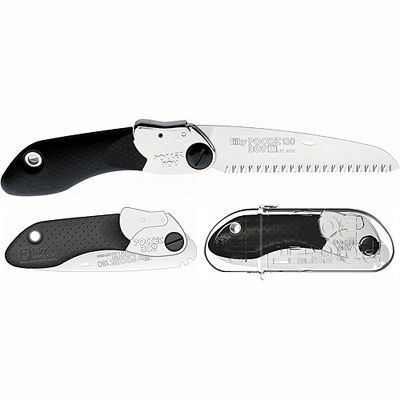 Silky Fox Pocketboy Saw - 130-10 is rated 5/5 based on 5 customer reviews. Ive had pruning saws in the past which didnt last long, the plastic handles snapped. This has a rubber coated steel handle and a very sharp blade, very handy. I have not really tested it as yet but it sliced through a few twigs on bushes in my garden. I bought this along with other Christmas gifts, all were delivered quickly and very well packaged. It is very strong, well balanced and comes in a very handy case that can be attached to a belt. I have a larger folding blade saw, which was cheaper but has not stood up well to use. I like the 5' (130mm) length blade, it seems an ideal size for both strength and flexibility. The rubber covering to the handle feels good and hopefully will be OK in the wet and the eyelet will be perfect for a lanyard. I'm really looking forward to using this tool in the spring. Seems well made and extremely sharp; I like it a lot. It's good that new blades can be fitted. Very efficient cutting, and compact. Fits nicely into Fjallraven Barents trouser pocket. Plastic sheath not needed.